LONDON (AP) — British opposition leader Jeremy Corbyn rallied his Labour Party on Wednesday, calling for a clampdown on unfettered capitalism and a huge investment in public services as he tried to refocus attention on domestic policies after an annual conference dominated by Brexit. A veteran left-winger who was the surprise winner of Labour’s 2015 leadership contest, Corbyn favors a brand of openly socialist politics that was banished during the centrist, “New Labour” years of then Prime Minister Tony Blair. Corbyn’s attacks on Prime Minister Theresa May’s “nasty, cynical” Conservative government and the social pain caused by cuts to public spending were cheered loudly by Labour delegates. Party members applauded promises of free childcare, increased funding for police forces and a huge social-housing program. Corbyn committed Labour to a huge investment in renewable energy to slash carbon emissions and create a “green jobs revolution” if Labour returns to power. Corbyn also tried to allay fears that Labour has become hostile to Jews under his leadership. Critics allege that the longtime critic of Israel’s treatment of Palestinians has allowed anti-Semitic abuse to go unchecked. But the party’s four-day conference in the port city of Liverpool was overshadowed by its divisions over Britain’s looming exit from the European Union. Many members oppose Brexit and want Labour to fight for a new referendum that could keep Britain in the 28-nation bloc, but Corbyn says the party must honor voters’ decision in 2016 to leave. Corbyn didn’t mention backing a new Brexit referendum in his speech, saying only that “all options” should be on the table if the government couldn’t strike a divorce deal with the EU and get it approved by Parliament. “Labour respects the decision of the British people in the referendum,” Corbyn said. He had harsh words for May, his Conservative rival, who is struggling to unite her party behind her vision for Britain’s divorce from the EU. “If you deliver a deal that includes a customs union and no hard border in Ireland, if you protect jobs, people’s rights at work and environmental and consumer standards – then we will support that sensible deal,” Corbyn said. 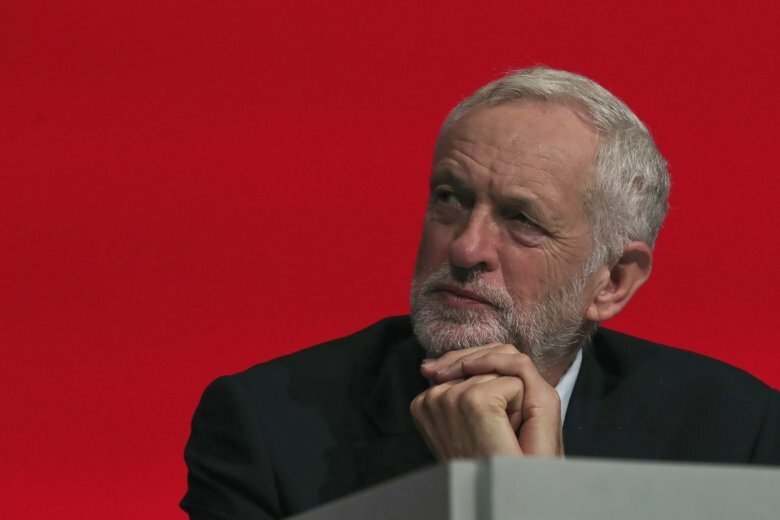 Corbyn’s radical agenda, which included calls for worker representatives on corporate boards, was welcomed by trade unions but drew concern from business groups.